Barack Obama Has Chosen Senator Joe Biden To Be His VP Nominee. 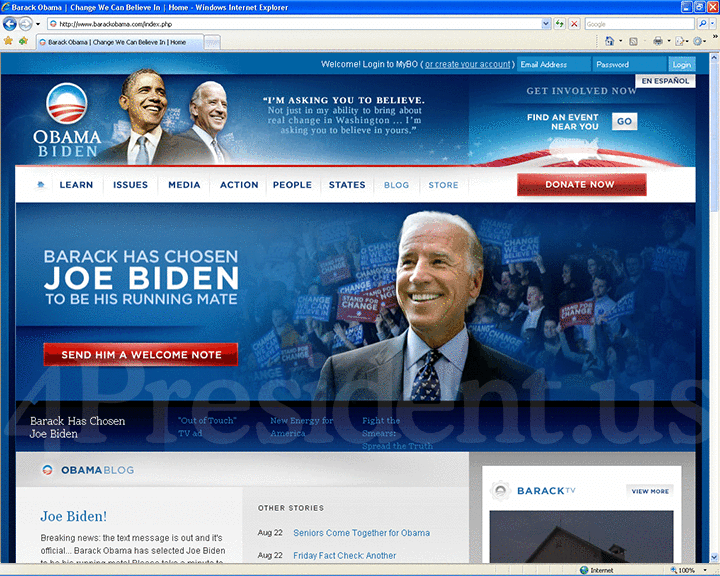 Breaking news: the text message is out and it's official... Barack Obama has selected Joe Biden to be his running mate! The following Text and E-Mail messages went out at about 2:00 AM to our supporters. Nineteen months ago, on a cold February day right here on the steps of the Old State Capitol, I stood before you to announce my candidacy for President of the United States of America. We started this journey with a simple belief: that the American people were better than their government in Washington – a government that has fallen prey to special interests and policies that have left working people behind. As I’ve travelled to towns and cities, farms and factories, front porches and fairgrounds in almost all fifty states – that belief has been strengthened. Because at this defining moment in our history – with our nation at war, and our economy in recession – we know that the American people cannot afford four more years of the same failed policies and the same old politics in Washington. We know that the time for change has come. For months, I’ve searched for a leader to finish this journey alongside me, and to join in me in making Washington work for the American people. I searched for a leader who understands the rising costs confronting working people, and who will always put their dreams first. A leader who sees clearly the challenges facing America in a changing world, with our security and standing set back by eight years of a failed foreign policy. A leader who shares my vision of an open government that calls all citizens – Democrats, Republicans and Independents – to a common purpose. Above all, I searched for a leader who is ready to step in and be President. Today, I have come back to Springfield to tell you that I’ve found that leader – a man with a distinguished record and a fundamental decency – Joe Biden. Joe Biden is that rare mix – for decades, he has brought change to Washington, but Washington hasn’t changed him. He’s an expert on foreign policy whose heart and values are rooted firmly in the middle class. He has stared down dictators and spoken out for America's cops and firefighters. He is uniquely suited to be my partner as we work to put our country back on track. Now I could stand here and recite a list of Senator Biden’s achievements, because he is one of the finest public servants of our time. But first I want to talk to you about the character of the man standing next to me. Joe Biden’s many triumphs have only come after great trial. He was born in Scranton, Pennsylvania. His family didn’t have much money. Joe Sr. worked different jobs, from cleaning boilers to selling cars, sometimes moving in with the in-laws or working weekends to make ends meet. But he raised his family with a strong commitment to work and to family; to the Catholic faith and to the belief that in America, you can make it if you try. Those are the core values that Joe Biden has carried with him to this day. And even though Joe Sr. is not with us, I know that he is proud of Joe today. It might be hard to believe when you hear him talk now, but as a child he had a terrible stutter. They called him “Bu-bu-Biden.” But he picked himself up, worked harder than the other guy, and got elected to the Senate – a young man with a family and a seemingly limitless future. Then tragedy struck. Joe’s wife Neilia and their little girl Naomi were killed in a car accident, and their two boys were badly hurt. When Joe was sworn in as a Senator, there was no ceremony in the Capitol – instead, he was standing by his sons in the hospital room where they were recovering. He was 30 years old. Tragedy tests us – it tests our fortitude and it tests our faith. Here’s how Joe Biden responded. He never moved to Washington. Instead, night after night, week after week, year after year, he returned home to Wilmington on a lonely Amtrak train when his Senate business was done. He raised his boys – first as a single dad, then alongside his wonderful wife Jill, who works as a teacher. He had a beautiful daughter. Now his children are grown and Joe is blessed with 5grandchildren. He instilled in them such a sense of public service that his son, Beau, who is now Delaware’s Attorney General, is getting ready to deploy to Iraq. And he still takes that train back to Wilmington every night. Out of the heartbreak of that unspeakable accident, he did more than become a Senator – he raised a family. That is the measure of the man standing next to me. That is the character of Joe Biden. Years later, Senator Biden would face another brush with death when he had a brain aneurysm. On the way to the hospital, they didn’t think he was going to make it. They gave him slim odds to recover. But he did. He beat it. And he came back stronger than before. Maybe it’s this resilience – this insistence on overcoming adversity – that accounts for Joe Biden’s work in the Senate. Time and again, he has made a difference for the people across this country who work long hours and face long odds. This working class kid from Scranton and Wilmington has always been a friend to the underdog, and all who seek a safer and more prosperous America to live their dreams and raise their families. Fifteen years ago, too many American communities were plagued by violence and insecurity. So Joe Biden brought Democrats and Republicans together to pass the 1994 Crime Bill, putting 100,000 cops on the streets, and starting an eight year drop in crime across the country. For far too long, millions of women suffered abuse in the shadows. So Joe Biden wrote the Violence Against Women Act, so every woman would have a place to turn for support. The rate of domestic violence went down dramatically, and countless women got a second chance at life. Year after year, he has been at the forefront of the fight for judges who respect the fundamental rights and liberties of the American people; college tuition that is affordable for all; equal pay for women and a rising minimum wage for all; and family leave policies that value work and family. Those are the priorities of a man whose work reflects his life and his values. That same strength of character is at the core of his rise to become one of America’s leading voices on national security. He looked Slobodan Milosevic in the eye and called him a war criminal, and then helped shape policies that would end the killing in the Balkans and bring him to justice. He passed laws to lock down chemical weapons, and led the push to bring Europe’s newest democracies into NATO. Over the last eight years, he has been a powerful critic of the catastrophic Bush-McCain foreign policy, and a voice for a new direction that takes the fight to the terrorists and ends the war in Iraq responsibly. He recently went to Georgia, where he met quietly with the President and came back with a call for aid and a tough message for Russia. Joe Biden is what so many others pretend to be – a statesman with sound judgment who doesn’t have to hide behind bluster to keep America strong. Joe won’t just make a good Vice President – he will make a great one. After decades of steady work across the aisle, I know he’ll be able to help me turn the page on the ugly partisanship in Washington, so we can bring Democrats and Republicans together to pass an agenda that works for the American people. And instead of secret task energy task forces stacked with Big Oil and a Vice President that twists the facts and shuts the American people out, I know that Joe Biden will give us some real straight talk. I have seen this man work. I have sat with him as he chairs the Senate Foreign Relations Committee, and been by his side on the campaign trail. And I can tell you that Joe Biden gets it. He’s that unique public servant who is at home in a bar in Cedar Rapids and the corridors of the Capitol; in the VFW hall in Concord, and at the center of an international crisis. That’s because he is still that scrappy kid from Scranton who beat the odds; the dedicated family man and committed Catholic who knows every conductor on that Amtrak train to Wilmington. That’s the kind of fighter who I want by my side in the months and years to come. That’s what it’s going to take to win the fight for good jobs that let people live their dreams, a tax code that rewards work instead of wealth, and health care that is affordable and accessible for every American family. That’s what it’s going to take to forge a new energy policy that frees us from our dependence on foreign oil and $4 gasoline at the pump, while creating new jobs and new industry. That’s what it’s going to take to put an end to a failed foreign policy that’s based on bluster and bad judgment, so that we renew America’s security and standing in the world. We know what we’re going to get from the other side. Four more years of the same out-of-touch policies that created an economic disaster at home, and a disastrous foreign policy abroad. Four more years of the same divisive politics that is all about tearing people down instead of lifting this country up. We can’t afford more of the same. I am running for President because that’s a future that I don’t accept for my daughters and I don’t accept it for your children. It’s time for the change that the American people need. Well, it's great to be here! On the steps of the old State House in the land of Lincoln. President Lincoln once instructed us to be sure to put your feet in the right place. Then stand firm. Today, Springfield, I know my feet are in the right place. And I am proud to stand firm for the next president of the United States of America, Barack Obama. Folks, Barack and I come from very different places, but we share a common story. An American story. He was the son of a single mom, a single mom who had to struggle to support her son and her kids. But she raised him. She raised him to believe in America. to believe that in this country there is no obstacle that could keep you from your dreams. If you are willing to work hard and fight for it. I was different. I was an Irish-Catholic kid from Scranton with a father who like many of yours in tough economic times fell on hard times, but my mom and dad raised me to believe, it's a saying Barack you heard me say before, my dad repeated it and repeated it. Said champ, it's not how many times you get knocked down, it's how quickly you get up. It’s how quickly you get up. Ladies and gentlemen, that's your story. That’s America's story. It’s about if you get up, you can make it. That’s the America Barack Obama and I believe in. That's the American dream. And ladies and gentlemen, is there no ordinary times, and this is no ordinary election. Because the truth of the matter is, and you know it, that American dream under eight years of Bush and McCain, that American dream is slipping away. I don't have to tell you that. You feel it in your lives. You see it in your shrinking wages, and the cost of everything from groceries to health care to college to filling up your car at the gas station. It keeps going up and up and up, and the future keeps receding further and further and further away as you reach for your dreams. You know, ladies and gentlemen, it is not a mere political saying. I say with every fiber of my being I believe we cannot as a nation stand for four more years of this. We cannot afford to keep giving tax cuts after tax cuts to big corporations and the wealthiest Americans while the middle class America, middle class families are falling behind and their wages are actually shrinking. We can't afford four more years of a government that does nothing while they watch the housing market collapse. As you know, it's not just the millions of people facing foreclosure. It’s the tens of millions of your neighbors who are seeing the values of their homes drop off a cliff along with their dreams. Ladies and gentlemen, your kitchen table is like mine. You sit there at night before you put the kids -- after you put the kids to bed and you talk, you talk about what you need. You talk about how much you are worried about being able to pay the bills. Well, ladies and gentlemen, that's not a worry John McCain has to worry about. It’s a pretty hard experience. He’ll have to figure out which of the seven kitchen tables to sit at. Folks, again, it's not political sloganary when I say we literally can't afford four more years of this non-energy policy written by and for the oil companies, making us more and more dependent from hostile nations on our ability to run this country and literally, not figuratively, literally putting America's security at risk, we can't afford four more years of a foreign policy that has shredded our alliances and sacrificed our moral standing around the world. Ladies and gentlemen, that's the bad news. But there is good news, America. We don't have to have four more years of George W. Bush. And John McCain. The next President of the United States is going to be delivered to the most significant moment in American history since Franklin Roosevelt. He will have such an incredible opportunity, incredible opportunity, not only to change the direction of America, but literally, literally to change the direction of the world. Barack Obama and I believe, we believe with every fiber in our being that our families, our communities as Americans, there's not a single solitary challenge we cannot face if we level with the American people. And I don’t say that to say it; history, history has shown it. When have Americans ever, ever, ever, let their country down when they’ve had a leader to lead them? Ladies and gentlemen, we believe that our tomorrows will be better than our yesterdays, and we believe we’ll pass on to our children an even better life than the one we lived. That literally has been the American way, and it can be that way again. But there's a big, missing piece. The missing piece is leadership. In all my time in the United States Senate, and I want you to know there's only four senators senior to me, but Barack, there's still 44 older than me. I want you to know that part. But all kidding aside, of all my years in the Senate, I have never in my life seen Washington so broken. I have never seen so many dreams denied and so many decisions deferred by politicians who are trying like the devil to escape their responsibility and accountability. But, ladies and gentlemen, the reckoning is now. And the reality, the reality is that we must answer the call or we will risk the harshest version and verdict of history. These times call for a total change in Washington’s worldview. These times require more than a good soldier. They require a wise leader. A leader -- a leader who can deliver. A leader who can deliver the change we need. I’ll say straight up to you – John McCain and the press knows this, is genuinely a friend of mine. I’ve known John for 35 years. He served our country with extraordinary courage and I know he wants to do right by America. But the harsh truth is, ladies and gentlemen, you can't change America when you boast. And these are John's words, quote, the most important issues of our day, I’ve been totally in agreement and support of President Bush. Ladies and gentlemen, that's what he said. You can't change America when you supported George Bush's policies 95% of the time. You can't change America when you believe, and these are his own words, that in the Bush administration we’ve made great progress economically. You can't change America and make things better for our senior citizens when you signed on to Bush's scheme of privatizing social security. You can't change America and give our workers a fighting chance when after 3 million manufacturing jobs disappear, you continue to support tax breaks for companies who ship our jobs overseas. You can't change America and end this war in Iraq when you declare and, again, these are John's words, no one has supported President Bush in Iraq more than I have, end of quote. Ladies and gentlemen, you can't change America, you can't change America when you know your first four years as president will look exactly like the last eight years of George Bush's presidency. You know, you learn a lot of things being up close with a guy. Let me tell you about Obama. You learn a lot about a man when you campaign with him. When you debate him 12 or 13 times. When you hear him speak. When you see how he thinks. And you watch how he reacts under pressure. You learn a lot about his strength of his mind, and I think even more importantly, the quality of his heart. Ladies and gentlemen, no one knows better than I do that presidential campaigns are crucibles in which you’re tested and challenged every single day. And over the past 18 months, I’ve watched Barack meet those challenges with judgment, intelligence, and steel in his spine. I’ve watched as he's inspired millions of Americans, millions of Americans to this new cause. And during those 18 months, I must tell you, frankly, I’ve been disappointed in my friend, John McCain, who gave in to the right wing of his party and yielded to the very swiftboat politics that he so -- once so deplored. And folks, campaigns for presidents are a test of character and leadership. And in this campaign, one candidate, one candidate has passed that test. Barack has the vision, and what you can't forget, you know his vision, but let me tell you something. He also has the courage, the courage to make this a better place, and let me tell you something else, this man is a clear eyed pragmatist who will get the job done. I watch with amazement as he came to the Senate. I watch with amazement. He made his mark literally from day one reaching across the aisle to pass legislation to secure the world's deadliest weapons, standing up to some of the most entrenched interests in Washington, risking the wrath of the old order to pass the most sweeping ethics reform in a generation. But I was proudest, I was proudest, when I watched him spontaneously focus the attention of the nation on the shameful neglect of America’s wounded warriors at Walter Reed Army Hospital. Ladies and gentlemen, I know I’m told I talk too colloquially, but there's something about this guy. There's something about this guy. There's something about Barack Obama that allows him to bring people together like no one I have worked with and seen. There’s something about Barack Obama that makes people understand if they make compromises they can make things better. It’s been amazing to watch him. But then again, that's been the story of his whole life. I end where I began. This is a man raised by a single mother who sometimes was on food stamps as she worked to put herself through school, by grandparents from the prairies of Kansas who loved him, a grandfather, a grandfather who marched in Paton's Army and then came home and went to college on the G.I. Bill, and a grandmother, a grandmother with just a high school education, started off working in a small bank in the secretarial pool and rose to be vice president of that bank. Ladies and gentlemen, ladies and gentlemen, these remarkable people gave Barack Obama the determination and drive, and, yes, the values to turn down that big job on Wall Street, to come to Chicago’s south side, where he helped workers help themselves after the steel mills had been shut down and the jobs disappeared. Ladies and gentlemen, my wife Jill, who you’ll meet soon, is drop dead gorgeous. My wife Jill, who you’ll meet soon, she also has her doctorate degree, which is a problem. But all kidding aside, my Jill, my Jill, my wife Jill and I are honored to join Barack and Michelle on this journey, because that's what it is. it's a journey. We share the same values, the values that we had passed on to us by our parents and the values Jill and I are passing on to our sons Beau and Hunter and Ashley. Ladies and gentlemen, I’m here for their future. I’m here for the future of your kids. I’m here for everyone I – I’m here for everyone I grew up in Scranton, Pennsylvania, who’s been forgotten and everybody in Claymont, Delaware, in Wilmington where I lived. I’m here for the cops and the fire fighters, the teachers and the line workers, the folks who live – the folks whose lives are the measure of whether the American dream endures. Ladies and gentlemen, this is no ordinary time. This is no ordinary election. And this may be our last chance to reclaim the America we love, to restore America’s soul. Ladies and gentlemen, America gave Jill and me our chance. It gave Barack and Michelle their chance to stand on this stage today. It’s literally incredible. These values, this country gave us that chance. And now it's time for all of us, as Lincoln said, to put our feet in the right place and to stand firm. Ladies and gentlemen, it's time to elect Barack Obama president. It’s our time. It’s America’s time. God bless America, and may he protect our troops.